Very Rare! Adorable Cottage on Snead Island, Boat Dock & Beach 250 ft.
Snead Island is surrounded by the Manatee River & Tampa Bay & connected to the city of Palmetto by a small bridge. Fish for sea bass, snapper, snook & grouper in the river as well as in the Tampa Bay & Gulf of Mexico. This adorable Snead Island cottage is nestled on 2 beautiful acres of majestic oaks, orange trees & coconut palms at the opening of the Tampa Bay. The front yard has beautiful southern Oak trees. Newly furnished with very clean & comfortable bedrooms, living room, dining room, full kitchen, attached laundry room & a screened, enclosed veranda. The bathroom has a walk-in shower and back entrance is wheelchair accessible. Continue down the shell drive 250 ft from your back door onto a 100 ft dock to lounge, watch for dolphins and enjoy the sun setting on the Manatee River. A 35 foot boat slip is also available for a small additional fee, water & elec provided. Just to the right of the dock, is a small private white sand beach, for swimming, kayaking or just relaxing in the lounge chairs, under a beautiful mangrove tree. The outside world of shopping, grocery stores, malls & waterfront restaurants are all within a 15 minute drive. Beautiful 365 acre Emerson Point Preserve Beach Park is withing walking or bike riding distance on the island. There are bike trails, nature & birding trails, a canoe & kayak launch, white sandy beaches for swimming, fishing, picnic tables, barbecues, restrooms and a tower climb for an incredible view of the sunshine skyway bridge and gulf of Mexico. Pets on leashes are welcome in the park and on the beach for swimming. A great place to unwind and feel like you've stepped back in time. Visit Sarasota cultural center, world renowned St. Armand's Circle; less than 1/2 hour to St. Petersburg and the retail shops at Bay Walk; under an hour to the excitement of downtown Tampa: or 1.5 hours to Walt Disney World, Sea World, Universal and MGM Studios. Seafood festivals and many other fun activities happen weekly in Palmetto and just across the bridge in Bradenton. Bev has been a Florida resident for 40 year. They both love the area, know it well and are happy to share their knowledge with travelers to our sunny state. Len, inventor of The Tundra Buggy, resided in Manitoba Canada most of his life. He used his invention to take many people on expeditions to view and photograph Polar Bears. Bev is one of the founders and the current VP/Treasurer for Everglades Angels Dog Rescue, an all volunteer charity that rehabilitates and rehomes badly abused dogs dumped in the Everglades. Snead Island is a wonderful place for living as well as vacationing. Very friendly small town feel in beautiful surroundings. The entire Island including Emerson Park Preserve is also very pet friendly. Swimming, kayaking, boating, Emerson Point Nature Preserve with many walking trails and swimming, fishing, bait shop on the island, yacht club available for two month trial membership to our guests, which includes use of the pool and all facilities including a boat launch. Snead Island is old florida at it's best. Such a relaxing atmosphere. Bathroom has walk in shower, no tub. Snead Island sits at the mouth of the Manatee River, Tampa Bay and Gulf of Mexico. Saltwater fishing, boating or kayaking from the property. Parking on property next to cottage. Lots of room for RV or boat. Back entrance is wheelchair accessible. 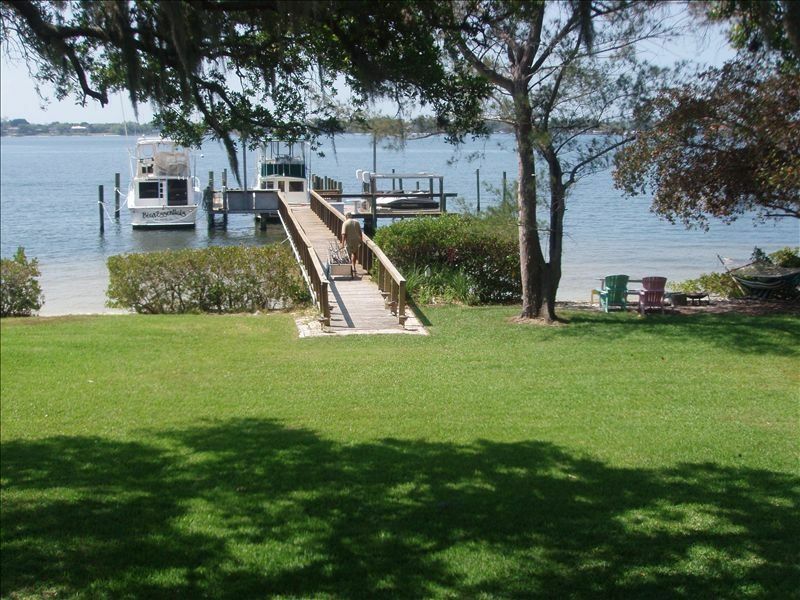 100 ft dock w/table & chairs, 35ft boat slip available for additional fee, water & elec. Small semiprivate beach w/hammock, picnic table & chairs & fire pit. Beautiful grounds and very peaceful ! We really loved staying here. From the beautiful grounds and the view of the Manatee River, what more could you ask for. Len and Bev made us feel like family. The fact that our dog was welcomed and he made friends....made us all happy ! The cottage was very comfortable and furnished nicely. It was a great week ! Very clean accommodations and extremely warm host. This was an excellent spot for the avid angler. Easy access to the Gulf. Bev and Len are very sweet people. We enjoyed our time at their lovely rental cottage. Hope to stay again soon. We were so pleased with our stay at this property. We were upgraded to the apartment that faces the Manatee River. Our view from the space was breathtaking. We watched dolphins and sea rays swim by right from the dock. The host is extremely accommodating and cares genuinely for her guests and their pets. We wanted for nothing! A fully upgraded kitchen was ours, as well as a gas grill outside. This property is a gem! I have no doubt you will love it here...we did. Old Florida style cottage. Quiet, shaded, relaxing are just few terms to describe this wonderful place. Plus add in the short walk to the water for fishing, wading, boating, and picnics giving you an amazing get away. You will never want to leave the property, but if you do, it is a short drive to all the Tampa Bay area has to offer. The owners are friendly, easy going, and very welcoming. They were great to work with. If you are looking to escape to the hustle and bustle of everyday life, this is the place to stay. This is our 4th year at the property and it has every thing we need. The location is perfect for visiting our friends. Restaurants, shopping and beaches are 15 minutes away. Our 2 goldens max&murf have all the room they need to run and play.The owners treat you like you are family. A 100 ft dock on property for fishing or lounging. Slip available for under 35 ft boat for small additional fee. Island~Salt water at mouth of Manatee River/Gulf of Mexico/Tampa Bay. White sandy beach w/swimming & barbecue. Emerson Point Wildlife state beach park on the island with picnic tables,barbecue, restrooms,nature walks, bike trails, swimming. Walk your dog or ride your bike around this beautiful island. $600. initial payment is required at time of booking. The remaining balance is required 90 days prior to first rental date. If cancelled less than 90 days prior to arrival, rent will be returned, less $100 admin fee, if unit is re-rented.